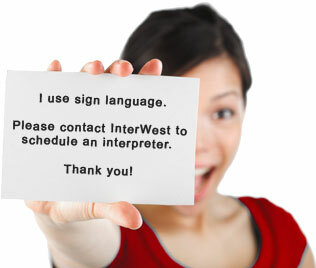 InterWest Interpreting is Utah's leading provider of quality certified sign language interpreting services. Over the last 20 years our agency has interpreted for thousands of medical, legal, educational, and professional appointments. All our interpreters are certified and bound to the Code of Professional Conduct. Understand the basics about deaf culture and using an interpreter. Learn how to request an interpreter and print the easy contact card pictured above. Information about interpreting through video conference technology. "InterWest always provides the most qualified interpreters and they represent the interpreting profession well. Their interpreters are able to provide the specialized skills needed for a variety of interpreting assignments." "… the skills of interpreters assigned to our meetings have been of high caliber. The InterWest interpreters are punctual and professional." InterWest provides sign language interpreting for government agencies, healthcare providers, legal and courtroom situations, religious settings, business meetings, mental health settings, theater and entertainment, conferences, educational settings and other environments. InterWest is proud to hire the finest, certified interpreters in the community. Many interpreters are native signers, have many years of experience, and are consummate professionals. All InterWest interpreters adhere to the Code of Professional Conduct. To further serve the Deaf community InterWest now offers Video Remote Interpreting. InterWest is an organizational member of the National Registry of Interpreters for the Deaf (RID), a national membership organization of professionals who provide sign language interpreting/transliterating services for Deaf and hard-of-hearing persons. InterWest is also a member of the Utah Registry of Interpreters for the Deaf (UTRID).